Today I bring you an interview, which has been in the works for a very long time. I’d say over a year! Steve Sneyd is a British/American poet, who has been involved in Genre Poetry for decades. He’s been a prolific poet appearing in most, if not all of the SF poetry venues, he’s published anthologies and collections of other peoples’ poetry through his small press Hilltop Press, he has written essays for many an anthology and other occasions, and produced a handwritten, A4 double-sided poetry FanZine (which you need a magnifying glass to read) called DataDump since the 1980’s. You can read his biography, which is basically his only web presence besides Hilltop Press, and he’s written an alternate biography in verse. In this digital age, it’s rare to come across anyone who is almost as completely off the grid as is Steve Sneyd. But I think his body of work is significant enough that it was worth the treasure hunt. I sent him my usual list of interview questions by snail mail and we’ve corresponded haltingly ever since I first approached him about this interview. I was never able to find a phone number, either, and my query as to if I could call went unanswered. He sent his answers in long-hand with much abbreviation. I’ve taken the liberty of filling in the missing pronouns and various other “unimportant” words for ease of reading. Diane Severson for Amazing Stories: Do you write exclusively SF poetry or do you also write so-called “literary” poetry or other genre poetry as well? If yes, which ones? Do you also write prose or non-fiction? Steve Sneyd: As well as SF poetry, I’ve also written much dark fantasy and Arthurian poetry, and a considerable amount of “mainstream” – non-genre poetry also. (I’ve never systematically done the figures, but as an impressionistic guess, would say about 40% of my published poetry has been SF, and overall perhaps 70% has been genre). Boundary drawing can be hard – e.g. is a poem about the historical Dracula genre or “mainstream”? I’ve also written short stories – about 500 published – though very little in recent years – and a very large amount of non-fiction: books about graphic poetry (poetry presented in comic strip format – title A Word in Your Eye; about the poetry of Robert Calvert – Gnawing Medusa’s Flesh to accompany Dave Hyde’s bio of Calvert; a biography of Lilith Lorraine to accompany a reprint of her genre poetry; a series of books about the use of poetry in UK & US SF fanzines/little mags. Also many articles – on SF poetry/poets, proto-SF, (the) use of poetry within SF novels, historical and mythical/folklore topics, including many on Arthurian subjects, on OULIPO, on castles, etc. etc. 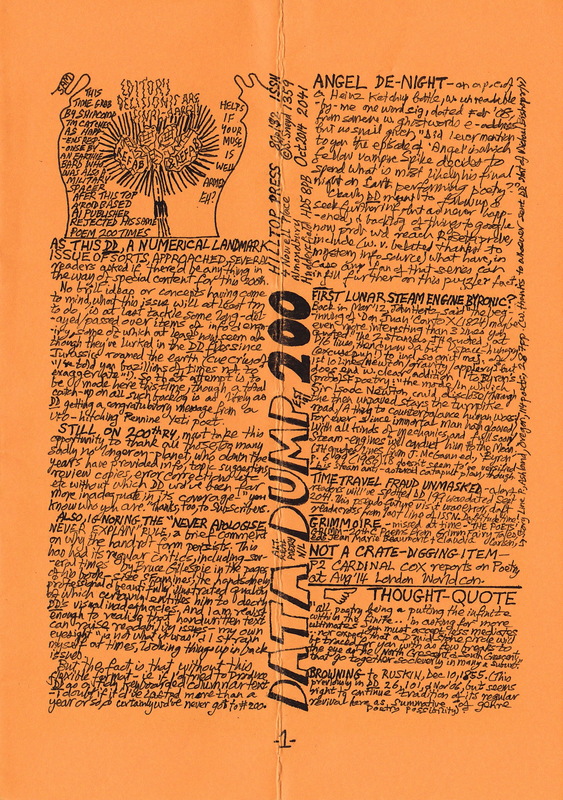 And myriad book reviews – in recent years mainly for my own genre-poetry newletter, Data Dump, published since 1991, but earlier for a variety of magazines. AS: Are you a full time writer? If not, what else do you do? What does a typical writing day look like for you? SS: My last job before retiring in 2007 was as a creative wrting tutor in adult education, which I had done from 1992. Before that, for many years, I was a copywriter, in a newspaper and ad-agencies etc. I suppose now, as I am retired, I could claim to be a writer insofar as I have occupation! Realistically, a typical writing day would consist of far too much procrastination, interrupted by bursts of writing activity! (But really it varies so much that it would be very hard to describe any day as typical). Including a varying range of techniques to trick myself into making a start. AS: What do you do to keep the Muse primed? Or are you a natural font of ideas? Where do you get your ideas? SS: Ideas can come from anywhere – flashbacks of memory, of places, people events; items from the radio or books, curious facts or images; fragments of phrases, odd images springing to mind; etc. etc. I’m endlessly writing such bits down on paper (always carry some, and a pen), or into notebooks – though the problem is the vast majority never develop any further, just silt up in vast accumulations of such scraps, though sometimes, years later even, one or another will resurface and a poem will come together out of that seed. AS: Do you prefer formal poetry or free-verse or prose poetry? Please elaborate! AS: Do you revise your poetry once the basic poem is written? How do you decide when a poem is “finished”? SS: It’s impossible to generalise. Some poems will feel “right” at the 1st draft, other get altered over and over, sometimes over years – and that can apply as much to a very short poem as to occasional long, even very long poem. The old saying that “a poem is never completed, only abandoned” perhaps applies – it seems to me that the “reptile brain”, which I think of as what, rather than the conscious mind, is the real author, simply decides at some point “that’s it”. Of course, if I look, maybe years after, at a published poem, perhaps come back to it to try to decide what to include in a collection, I often feel that I could have done it very differently, and I’ve also found sometimes that when “performing” a poem at a reading, words change in it. AS: How much time and effort do you spend on submitting your work? Do you have any advice in this regard? Something that might help those just starting out to streamline the process? In terms of advice, I would suggest familiarising yourself with the publication being submitted to, i.e. not submitting wildly irrelevant material; being patient – most editors are part time, many get vast floods of submissions, so instant response is difficult; don’t expect details explanations of rejections, or argue over them; and, when work has been accepted, be patient (within reason) in waiting for it to appear. AS: Haha! You have been exceedingly patient waiting for this interview to appear! You have won awards and accolades for your poetry throughout your career (feel free to list them, to remind me). Which ones are you most proud of? Which ones do you still aspire to? Or do you? SS: Awards a bit thin on ground. Upstairs I have the Peterson Trophy, a metal P (kept by me in an ancient bird’s nest found in a bush in the garden, (it) looks likeably picturesque there), a one-off award received at a poets’ convention years back. I once won the annual Eddie Troke Award of the (sadly now defunct) Pendragon Society, for contributions to their Pendragon Magazine. Years ago I won a handful of competitions, and, again, though never a Rhysling winner had 5 or 6 Rhysling nominations over a number of years, though none recently. Various of my collections have had good reviews, which I suppose are accolades. I suppose “heights” of my SF poetry “career” were being one of the poets in a ‘Stanzas in Space’ special broadcast by BBC Radio 4 in 1995 (one of two readings I#ve done in planetaria, that one from the London one run by Madame Tussaud’s, the other being one of 2 SF poets reading – other Alice Lenkiewicz – at Liverpool Planetarium) and being one of 2 readers in (a) poetry item of (the) SF day of the Festival of the Year of Literature in Swansea, Wales (Dylan Thomasville! ), coincidentally, also 1995 (the other reader there was Steve Littlejohn, who read the whole of his mini-epic poem “The Chrysalis Machine”). 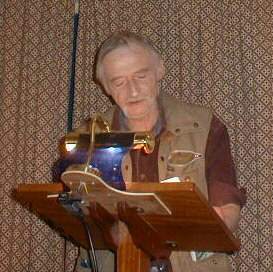 I was also privileged to read with Brian Aldiss and other important British SF poets (in the vast chamber of Oxford Town Hall) at a poetry convention in Oxford in 2005, and have read in the past at a variety of poetry festivals etc. etc. I achieved an MA in Poetry (1997) University of Huddersfield) – if that counts as (an) Award? AS: Which poets do you admire? Which have inspired you? Do you have any recommendations for new poets we should keep our eyes on? SS: (This is a very difficult one to answer, let alone briefly – I could go off in all sorts of directions! As this is getting so long, am getting brain-fade concentrating, so I will follow up on this properly separately, and just give an outline answer here). ADMIRE (could) give an enormous list. I’m inspired by too many very different poets to consciously pin it down, looking so far back to when I started writing poetry and some that maybe were big influences, like, say, the Beat poets (I do recall, (having) first heard at school, Ginsberg’s “Howl” – it had a huge impact) but I no longer relate to them as much. Dylan Thomas is another example – a craze in my teens, but I no longer relate much to his work either. I will just put a few names out of possible myriads, as said (and basically sticking to Brits, not being chauvinist but to manageabilise a list a bit): Auden, Browning, Tennyson, Eliot (American, but living in Britain), particularly “The Waste Land”. Shelley, particularly “Prometheus Unbound”. Byron (“Darkness” and “Cain”). A couple of unusual ones: Virgil The Aeneid; and Tacitus – NOT a poet, but writes with a compressive elegance, which means in effect “verse fossils” within his text about Agricola expedition is a wondrous summary of the Thule expedition, “Dispecta est et Thule” – total perfection, which, on and off, I’ve had stabs at translating – as with Catullis’ “O diet amor Excelsior” that Latin compression is a challenge in the English language. My all time favorite Rhysling winner is Andrew Joron’s “The Sonic Flowerfall of Primes” (from 1981). AS: Do you read a lot of poetry? Where do you find it? Do you have subscriptions to print magazines and/or journals? Which ones? SS: YES. I no longer read many sorts – but I still get some mags, either as exchanges, or which I have been getting so long that I became a “life subscriber”, like Star*Line, Dreams & Nightmares, The Magazine of Speculative Poetry and Pablo Lennis. I read collections, mainly review copies for DataDump or gifts from authors. I have dipped into a few online ones, but not regularly (time is a factor as I only have internet access at the library). Cosmopoetry.ro is an online anthology edited by Andrei Dorian Gheorghe, with amazing astronomical photos are always worth a look. Thank you very much, Mr. Sneyd, for your delightful, if hard to read, correspondence! I wish we could’ve delved further into some of the topics! Perhaps a Part 2 is in order. Flights from the Iron Moon a “gazetteer” collecting poetry from UK FanZines from the 1980’s. One thought on "Interview With SF Poet Steve Sneyd"